US staffer Zack got the chance to see the film at an advanced screening Tuesday night. Here is his spoiler free review! When I walked into the theater and sat down in my seat, I thought I knew what to expect out of this film. Based on the trailers and TV spots and all we’d heard from the cast and crew, I was sure that I knew the basic look and feel of the film. What I got instead was something entirely different. Everything that I expected out of this film aesthetically matched what I pictured in my head and then some. And it was just as emotional and thrilling as I’d hoped it would be. 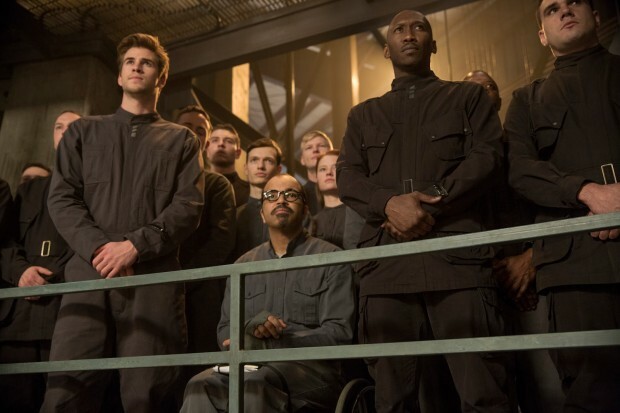 The citizens of District 13 watch Coin speak. But don’t go into this movie expecting something like Catching Fire. If you are expecting to see glorious shots of the Capitol or amazing, blazing dresses, you will be sorely disappointed. However, if you want to see our main characters as they spiral in and out of mental control, really feel the main themes of the books and films and watch a realistic portrayal of PTSD, war and propaganda, then The Hunger Games: Mockingjay—Part 1is the film for you. The film opens with lines that should be very familiar to those who have read the book: “Start with the things you know.” With these words, so brilliantly delivered by Jennifer Lawrence, we are thrust into Katniss’s world and the claustrophobic District 13. Julianne Moore’s President Coin leads the community with an icy presence that still manages to feel protective and caring. There is one particular scene in which Coin comforts Katniss that I found especially moving, and watching these two actresses on screen together was pure magic. However, Katniss needs a lot more than just comfort. Suffering from frantic nightmares and panic attacks, this is not your average heroine; instead, it is one who is tangible and more relatable than ever. Katniss is an emotional train wreck for the majority of the film, but what keeps her focused is Peeta, whose physical and emotional status clearly deteriorates as the film progresses. Josh Hutcherson’s acting is spot on, and he really captures the vulnerability of Peeta so well. Speaking of vulnerability, just about every familiar character has been entirely stripped down since when we last saw them in Catching Fire. Finnick’s background is explained in a very emotional and intriguing way, and Effie Trinket is a true fish out of water in District 13. Yet the best moments of the film were easily the scenes in which District 13 is bombed and when Katniss sings “The Hanging Tree”. Both scenes were truly chilling and haunting, and the music especially enhanced the emotional aspects of the scenes. And finally, tributes, I have to say that I feel that the split was completely warranted. I never really had any doubts, and now that I’ve seen the film, I can say without hesitation that this was the best way to adapt Mockingjay. The amount of character development in this film is more than there was in both The Hunger Games and Catching Fire combined. I’m also pleased to report that nothing in this film felt like filler at all: every single scene felt necessary to progress the story and delve deeper into the plot. In fact, a lot of the additions to the film ended up being some of the most memorable, including a daring rescue mission in the Capitol. The film ends with an emotional punch to the gut. Without giving away any spoilers, this is an ending that will cause loud reactions in the theater and leave audiences begging for more (as a side note, stay until the very end of the credits). This is a solid first half of a much larger story, and I can’t wait to see Part 2 next year.